« “Bright Star” A Magnificent Hit from Lyric Theatre! “The Curious Incident of the Dog in the Night-Time” is a fabulously rich mystery by Mark Haddon. The story is told from the perspective of a young man who looks at the world in a different way, a highly focused way. This book has been adroitly adapted for the stage by playwright Simon Stephens and has received numerous awards, including seven Olivier’s and five Tony’s for the productions. 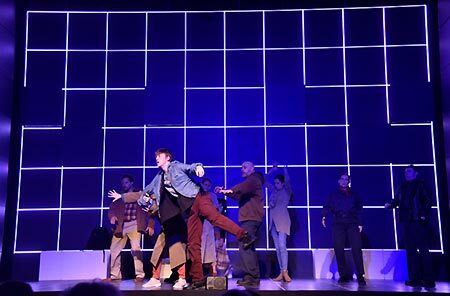 Oklahoma City Repertory Theatre has taken on the challenging task of bringing the play “The Curious Incident of the Dog in the Night-Time” to Oklahoma City audiences from April 4 through April 7, 2019. Thursday, Friday and Saturday evening performances are at 7:30 pm in the Freede Theatre at the Civic Center. There are two matinee performances at 1:30 pm on Saturday and Sunday. Guest director W. Jerome Stevenson has certainly done his homework to present this show with sensitivity and realism. Not only does dramaturg Anna Holloway contribute a great deal in research, but Stevenson works closely with the Oklahoma Autism Network. Stevenson also wisely called upon the choreography skills of Hui Cha Poos to assist the actors in movement. And of course, “The Curious Incident of the Dog in the Night-Time” boasts a fine casts of performers in the roles and as understudies. The story is told from a book a young Englishman, Christopher Boone, is writing about events that are occurring in his life. Christopher is about 15 years old and is being lovingly raised by his widowed father, Ed, two years after the death of Christopher’s mother. He attends a school catering to special needs students in his hometown of Swindon, England. He has the difficult symptoms coping with life that comes with autism. While he is brilliant, he is unable to relate to the world and others around him in simple interactions. His mathematical skills are genius level and he dreams of becoming an astronaut living in space where he will be insulated from direct interaction with humankind. He begins writing his story after encountering the neighbor’s dog, Wellington, dead in the garden, stabbed by a pitchfork. Christopher is a fan of Sherlock Holmes as many of us are and he decides to investigate the death. Although his father instructs him to ‘stay out of other people’s business’ he begins his investigation by interviewing neighbors and friends. His teacher and mentor, Siobhan encourages him in his writing and, in Stephens thoughtful adaptation it is Siobhan who narrates the play by reading his book. As she reads the actors begin to enact the scenes. Christopher is a thorough investigator and he searches doggedly for the murderer of Wellington. He eventually solves the crime, although he learns far more about his life, his mother’s life and many family secrets in the course of events. Coping with his new knowledge is a challenge for someone who focuses narrowly on trivia rather than emotions, and his story and ultimate success is heart-wrenching as well as heart-warming. The set design by Ben Hall is beautiful and intricate, and the props minimal. There are boxes that can be chairs and many scenes change as Christopher goes through doors represented by people. Often he must go through a turnstile represented by one of the actresses, and that event is amazingly creative. The concepts reflect Christopher’s view of the world. Lighting and Projection Design is by Adam Chamberlin beautifully defining the scenes. The original music is by Marcellus Hankins and the score unobtrusively creates the ambiance. As the story takes place in England, various English accents are used, but more as a dialectical cadence than a strong accent. The cast is quite phenomenal with Cameron Law as Christopher. Although Law seems awkward at first, it is merely the character’s perspective that his interpretation is realizing. There is quite a lot for the audience to absorb in the first moments of the production. As a ‘play within a play’ the viewpoint is unexpected and all of the actors seem slightly out of place. Suddenly realizing that the audience has the unique opportunity to view the action as Christopher Boone does, everything resolves, revolving into place just as the turnstile actress becomes quite natural. Law has developed that slightly off-focus look that sometimes occurs in people who are concentrating fervently on something others cannot see. This look can come upon anyone’s face, but is almost permanently etched on the visage of someone existing as if in a parallel universe. Now we begin to understand what being autistic must be like. His performance allows us to empathize with the character powerfully. Luke Thomas Eddy is Ed, Christopher’s father. In him we see a man with a lot on his plate. Dealing with all the horrible setbacks life throws at one is one thing and doing so while maintaining a constantly patient and gently understanding attitude is a tall order. Eddy plays a man with the impossible task of never losing his cool. Because that is impossible, unavoidably it happens. When Ed loses his cool, and realizes that he must regain trust between his son and himself, we see the guilt and tragedy reaching into his soul. The role is as hard to recreate as the life is to live and Eddy does a magnificent job. Lisa Fairchild is Siobhan the dedicated teacher and mentor Christopher relies on. Her character must remain emotionally objective in order to function in that capacity, yet sensitive, loving and generous to the young genius. Her excitement over Christopher’s accomplishment is genuine and her performance is inspired. Maria Hurdle is Judy, mother to Christopher. She does not have the patience to deal with such a difficult child and the heartbreak of her failure is etched upon her face for eternity. Her death, though symbolic, is the death of her motherhood. Her redemption can only be realized through love and personal sacrifice and Hurdle captures the conflict in the almost ravaged face of a beautiful fallen saint. Mary Buss plays Mrs. Shears, the neighbor whose dog Wellington is so savagely killed. When Christopher reaches out to her the rejection she gives him is like a laser connection suddenly snapping as if it were a rubber band. She has recently been abandoned by husband Roger and her bitterness is palpable; connected with the loss of her beloved animal, an unconditional love she cherished. Buss is also the rather quirky school principle who must approve giving Christopher advanced mathematical exams. And further, she is an incredibly realistic turnstile! Matt Cheek is Roger Shears, just a typical working class man with a wandering eye and a failed marriage. His character is similar in many respects to Ed, but they are also opposites and Cheek creates that dynamic comparison for the audience easily. Denise Moses is another neighbor, Mrs. Alexander. Mrs. Alexander is elderly and frail with an active nose for neighborhood news, and slightly indiscreet conversation. Moses conveys this genuinely caring but busybody lady with great skill, tenderness and a wonderful comic bent. She is a joy to watch as she creeps across the stage with one hand caressing her aching hip bones. She would love to be Christopher’s grandmother. The greatest comedy comes from Reverend Peters and others played by David Fletcher-Hall. Hall is a master of comic expression able to deliver a fleeting glance of astonishment or confusion that becomes permanently etched in the brain as one to cultivate for devious purposes in the lobby! His timing and brilliance not only as the good Reverend, but as a security officer at the train station, or even just one of the many busy people on a crowded street that Christopher must try to avoid is amazing and delightful. Dawson MacLeod is a Policeman, and many other ensemble parts, friend, rowdy, official and others and his commanding presence when required or his unobtrusive witnessing when needed is excellent and provides a wonderful addition to the cast. Allie Alexander, similarly as NO. 40 is equally outstanding. She moves from neighbor to traveler to haughty busy woman with ease and singularity. The cast is certainly impressive, and so is the understudy cast list. It would be interesting to see them as an alternative cast…there are so many points of interest this play has to offer that differing interpretations might be instructive and certainly entertaining. These unsung heroes have worked just as hard on the show and they deserve a nod! They are as follows: Jacob Livesay u/s Christopher, Ruth Charnay u/s Siobhan and Mrs. Alexander, Tiffany Tuggle u/s Judy Boone, Renee Krapff u/s Mrs. Shears and Kaylila Pasha u/s NO. 40. Pasha also assists Movement Director Hui Cha Poos as movement captain for the show. The entire cast is a magnificent group of solid performers. 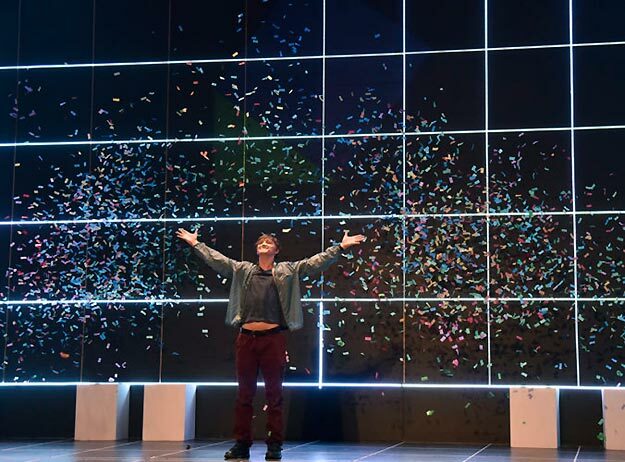 “The Curious Incident of the Dog in the Night-Time” is a worthy and instructional piece that is also highly entertaining thanks to the talented performers. W. Jerome Stevenson is an exceptionally dedicated and creative director leading a highly competent and resourceful team. The only negative aspect regarding this production is the short run. Five performances over a period of one long weekend are simply not enough for everyone wishing to attend. The entertainment factor alone makes the play worthwhile, and more importantly the information presented is vital to a vibrant community. There are many reasons why CityRep may have elected the short run and they are valid, however, this production should be seen by many more…perhaps they will return later—actors please save your scripts! One performer not yet mentioned should not be neglected. Luke appears as Sandy. Ed Boone reaches out to his son with a wonderful gift, a puppy! A loving creature for Christopher to snuggle with, so important for a boy who can’t tolerate human physical contact but can revel in romping with a loving, licking, wagging, wiggly best friend. Luke is available for adoption and performs courtesy of Country Roads Animal Rescue. Luke is a natural talent making his debut at CityRep in “The Curious Incident of the Dog in the Night-Time” and in spite of the truly magnificent performances from the human cast he steals the show in a brief moment. “The Curious Incident of the Dog in the Night-Time” is being presented to Oklahoma City audiences from April 4 through April 7, 2019. Thursday, Friday and Saturday evening performances are at 7:30 pm in the Freede Theatre at the Civic Center. There are two matinee performances at 1:30 pm on Saturday and Sunday. For information and tickets contact CityRep at www.cityrep.com or call the box office at 405-848-3761. Make every effort to catch this show, it is time well spent! fixed! thank you!! and totally okay to be “that guy”. Very glad you’re reading and helping us fix our editing errors! Appreciate you!